Part of an ongoing series highlighting the easy, no-cost ways that you can prepare your child for learning to read, today Christina will be discussing the benefits of reading with your child. Reading to your child is a fun and easy way to help prepare your child to read. Even the act of opening a book is teaching your child how a book works and what you do with it. Reading to your child will increase your child’s vocabulary, their general knowledge, prepare them for what letters and punctuation look like, as well as help create a bond between you and your child. Children enjoy reading because they are spending time with you and children who enjoy being read to are much more likely to be interested in learning to read on their own when they are older. Don’t worry about how well you read. What is important is the interaction you have with your child. If you create a reading time, this will become a ritual your child will look forward to. While many parents read to their child at bedtime, it can be any time you pick when you are not feeling rushed. Involve your child with the story. Let your child turn the pages. Talk to your child about the book, ask questions as you read and listen to what your child says. Let them point things out. Discuss the meaning of new words to help build their vocabulary. At the end of the story, let your child retell it in their own words to help build their listening comprehension. It’s okay to read the same story over and over. Even though adults get tired reading the same story all the time, your child is learning vocabulary and story patterns by memorizing the story. It is also fun for them to be able to predict what will happen. We all like to know things. This starts at an early age. Ask your librarian for book suggestions appropriate for your child’s age and current interests. If you are concerned about your child tearing pages, ask for board books which have cardboard pages. It is never too soon or too late to start reading. The sooner you begin reading to your child the more they learn and the more fun you have together sharing. Participate in reading programs like the library’s summer reading program which begins June 6th or the national book program 1000 Books Before Kindergarten which begins April 30th.These programs can give you and your child goals to keep you focused on reading regularly and add another element of fun. Ask at the Children’s Desk for details. We had so many outstanding entries in the Critter Contest this year! Hopefully you got a chance to see them on display during the month of July. Now that the summer reading program has ended, we have our winners on display in the kids department. Take a moment to stop by and check out these three cute critters! As we’re getting close to the end of summer reading (July 26th is the last day to pick up prizes! ), we’re already thinking ahead to next year. We’d love to know what you think! Please take a minute to complete this QUICK survey. Need a book suggestion for this summer? Look no further! Check back soon for more summer reading suggestions! If you are looking for a scary book to spice up the end of summer, this book would be a great choice.London is being plagued with deadly ghosts, and for some reason, only children have the ability to see and eliminate them. 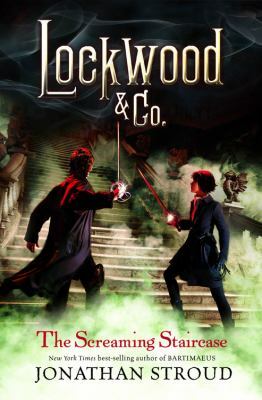 Lockwood & Co, a team of 3 children working without adult supervision, find themselves taking on an impossible quest. They must eradicate the ghosts from an old English manor known for its screaming staircase, the red room, and the deaths of those who have tried before them. This chilling, suspenseful, fun, edge-of-your seat, fast paced story is a winner. Recommended for grades 5 and up. Zoe dreams of playing the piano at Carnegie Hall. She knows that this is her destiny. What she gets, however, after finally convincing her parents to let her take lessons, is a Perfectone D-60 electric organ and a chance to play at Perform-O-Rama. Playing TV show tunes was not what she had in mind but she keeps at it and discovers some unexpected benefits. This book is fun, quirky, and inspiring. Recommended for 4-6 grades. Stop by IBEW Local 145 and get a photo with Foxy! Mark this location off on your scavenger hunt and return to the library for a chance in the raffle! (Click here or on the photo for a map) Don’t forget to get a picture and use #molinekids when you post it online!